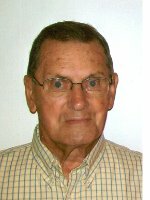 McKOWNVILLE – Donald E. Collins, 85, of McKownville, died peacefully on Saturday, August 4, 2012 with his family by his side. Mr. Collins was born in Albany, and lived in the area all his life. He was employed by the New York Central Railroad both before and after serving in the U.S. Navy during World War II. He later was employed for 35 years by the Watervliet Arsenal until his retirement. He was a life member of the Wigand Post #8444 of the VFW and the Colonie Elks Lodge #2192. He was an active member of the Western Turnpike Golf Club, and was on the board of directors of the Albany Bowling Association. Mr. Collins bowled for nearly 65 years, and in 1984 was inducted into the Albany Bowling Association Hall of Fame as a recipient of the Lifetime Achievement Award. He was an avid hunter and fisherman. Mr. Collins is survived by his beloved wife Virginia Childs Collins; his daughters Joanne Passineau (Tom), and Sharon Barcomb (David); his grandchildren Lisa Keating (Roger), Stacey Breakell (Douglas), Heather Tagliaferro (David), and Megan and Gregory Barcomb; his great grandchildren Annabelle and Reegan Keating; and by several nieces and nephews. He was predeceased by his sister Eleanor Griessel and his brothers Nelson and Peter Collins. Funeral services will be held in the Hans Funeral Home, 1088 Western Ave., Albany, Wednesday morning at 8:15, and from there to All Saints Catholic Church, Homestead St., Albany at 9:00. Relatives and friends are invited, and may call at the funeral home Tuesday from 4-8 p.m. Interment will be in Memory Gardens, Colonie. In lieu of flowers, the family suggests memorial contributions to Community Hospice of Albany, 445 New Karner Rd., Albany, NY 12205. To leave a message of condolence for the family, send a sympathy card, or obtain directions to the funeral home, please visit www.HansFuneralHome.com. Click here to view Mr. Collins’ resting place in Memory Gardens, Albany (Town of Colonie), New York. Aunt Ginny, Joanne & Family, Sharon & family- I am so sorry for your loss. I have many wonderful memories of Uncle Don and Christmas Eves at the house. My thoughts and prayers are with you all. Joanne and family, my thoughts are with you in this sad time. Dear Joanne, we are so sorry to hear of the passing of your father. May good memories comfort you and your family. Our hearts and prayers are with you. Dear Joanne and Family: I am so sorry to hear about the passing of your father. Hoping you will find comfort in the great memories. My prayer and thoughts are with you.